The Arturia AudioFuse Studio is a flexible, adaptable 18-in, 20-out audio interface that combines hugely powerful features, with top-tier sound quality and a focus on creative workflow. When you’re ready to take the next step with the quality of your studio products, AudioFuse Studio will be ready for you. It’s time your music had an upgrade The ultimate desktop audio interface, AudioFuse Studio gives you 4 world-class preamps, incredible connectivity, a versatile feature set, and a host of clever design features. A future-proof investment in your music, and one that will let you hear, record, and mix with clarity you’ve never heard before. 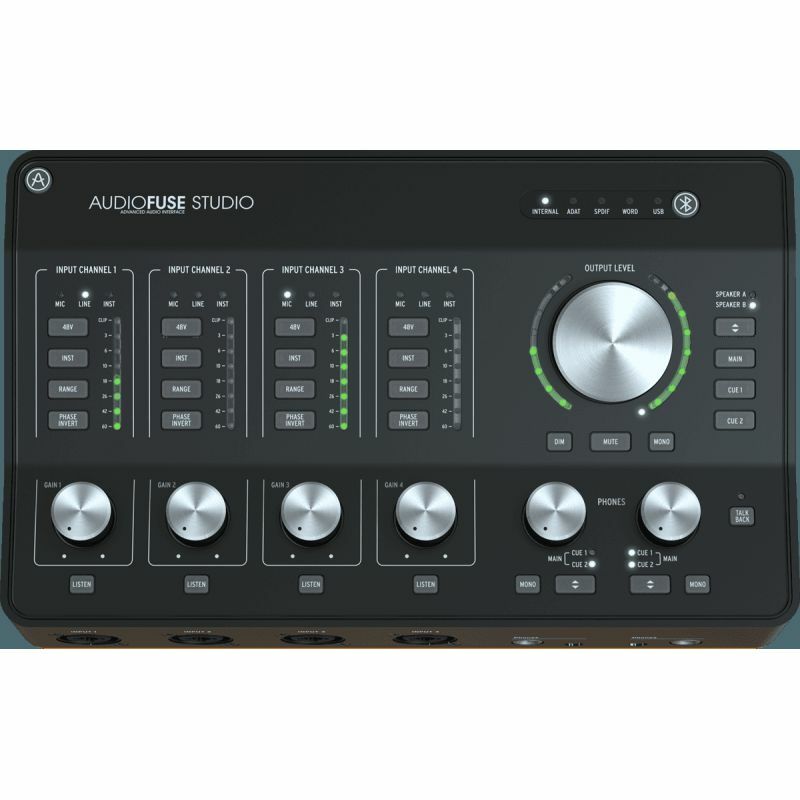 AudioFuse Studio lets you track your music with the highest quality; it lets you A/B your mix on different monitor setups; it lets you re-amp guitars; it lets you stream with Bluetooth using the best codec around; it keeps you working efficiently with a one-button, one-function interface. No matter what studio situation you find yourself in, AudioFuse Studio is the solution. The quality you deserve When your diary is filling up with sessions and your clients need you to deliver, you need equipment you can trust. AudioFuse Studio ticks all the boxes. Superb preamps, rock-solid performance, low latency, dozens of incredibly useful “just in case” features like a built-in phono preamp for vinyl sampling, Bluetooth streaming to your monitors or a channel in your DAW, awesome USB-C, ADAT, MIDI, and Word Clock connectivity and robust build.